This information is for software developers and mathematically inclined adventurers who want to quickly create plugins with interfaces to Dogwaffle. The GUI server is there to help you make interactive dialogs for plugins. Any program that supports activeX can use the GUI_Server. Lua is one of the first, and it's also extremly simple to use. Therefore, we'll take a look a a few samples in Lua first. --optionally respond to events as they happen. Here is another updated GUI example with a combo box and comments. --when all controls are added, open the panel. --wait for an event to happen. --If the returned value is <0 then OK or Cancel was pressed. -- -1 for OK and -2 for Cancel. --display the settings in the caption so we can see them. --this is for testing only. Here is another Example of Lua Script using the GUI interface options. --it's good form to mention the name of this script. --these two dashes (--) at the mean that these are comments. --Here is a function that will be called by the main program. --we have to unpack the 'packed' hex colors. 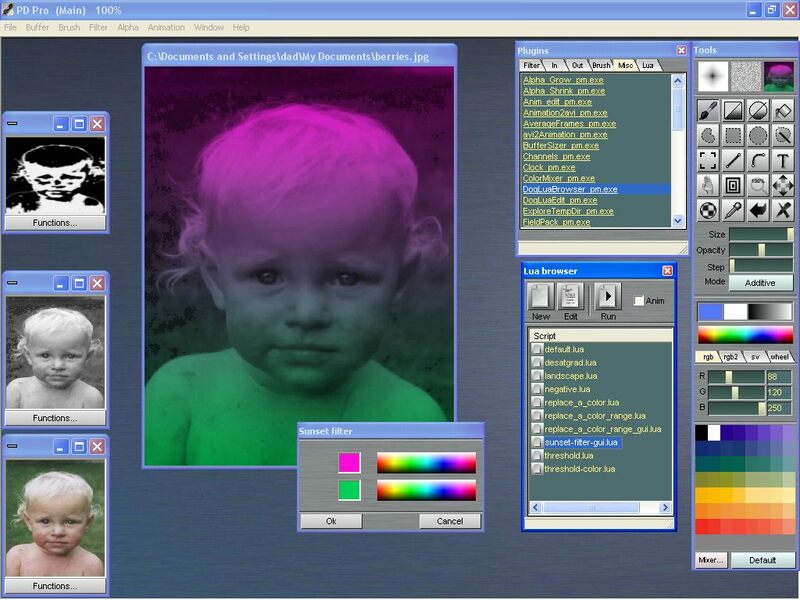 --combine the gradient with the image with multiplication. progress(0) -- reset the progress bar after usage. --we are going to open a panel with a couple of controls on it. --first, lets give the panel (window) a name. 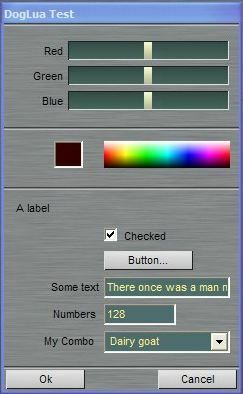 --we will now add a couple of controls for selecting color. --make use of the "hex" function to convert hex colors into decimal numbers. --hex numbers are 0,1,2,3,4,5,6,7,8,9,a,b,c,d,e,f, for 0-15. --to represent numbers between 0-255, we use two hex numbers. --00 = 0. FF = 255. --FF0000 would be bright blue. 0000FF would be bright red. -- now that we've added all our controls, we can open the panel. --this is our main event loop. --update the screen everytime the user clicks a control. --had before entering the script. --always close the panel before exiting or it will stay around. 'then you can use its methods. 'lets put a title on the titlebar of the panel we're going to open. 'you can optionally set a reletive spacing. 'the default value is 27 pixels. added, to the top of the next control. 'it's not the spacing in between controls. be up to 5 of these. method to access our controls later. to a text control after creation. index = GUI_Server.AddControl("ComboBox", "A Combo", 0, 0, 0, 0) 'a combo box. GUI_Server.SetList index, 0, "Dairy goat" 'now add list items. GUI_Server.SetList index, 1, "Puddle duck"
GUI_Server.SetList index, 2, "Family dog"
GUI_Server.SetList index, 3, "Crazy chicken"
GUI_Server.SetSettings index, 0, "Dairy goat" 'set the default string. 'do this after setting the list.
' a loop to handle events as they happen. 'if the value returned is -1, the OK button was pressed. -2 for Cancel. 'lets read values for specific controls and print it in a message box. 'the conrol index starts at 0, not 1. 'MyIndex = 19 'just pick any of them for this test. ''print a message showing that you can get the settings. 'we're done. Close up shop.